The Water Warriors Firefly is the mid-sized blaster of the Water Warriors line. Its design is similar to an extended Super Soaker Max-D 3000 or Super Soaker Max-D 4000. 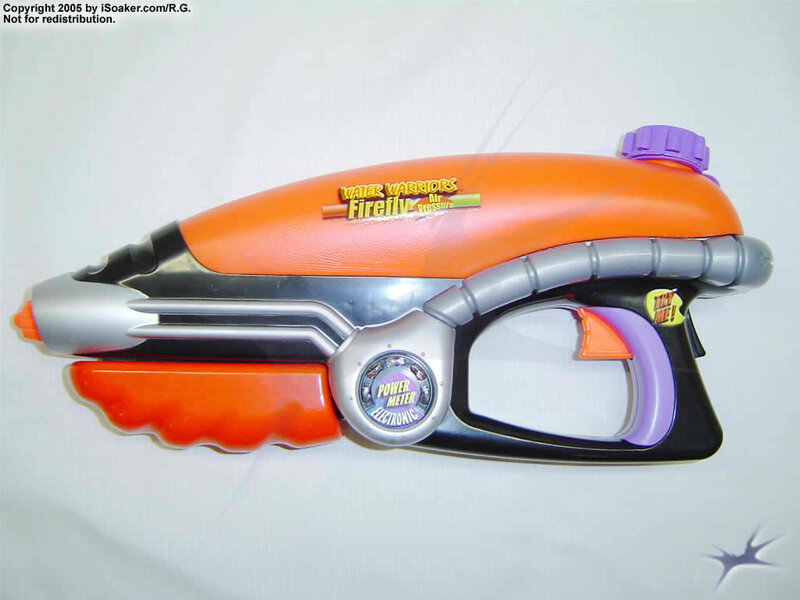 However, unlike the smaller Max-D Super Soakers, the Water Warriors Firefly has a guided pump and electronic pressure gauge. The reservoir is semi-translucent making it a little simpler to determine how much water the tank has remaining. The reservoir is filled through an opening with an externally tethered cap. 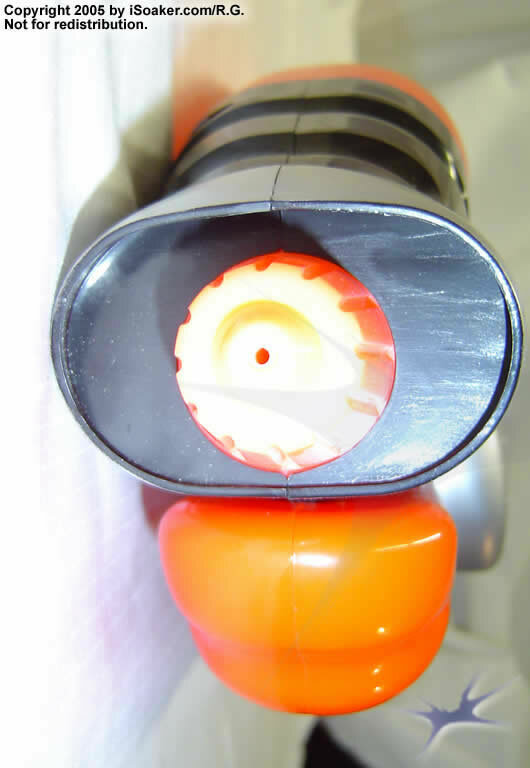 However, as this blaster requires that the reservoir be pressurized in order to push water out the nozzle, the cap must be secured tightly for the blaster to work well. 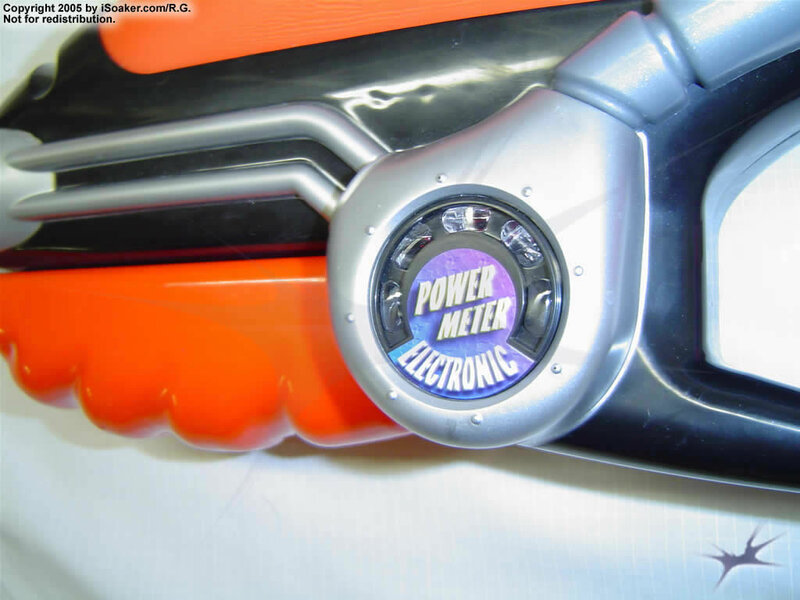 Maximum pressure is determined by the colour-changing electronic pressure gauge at the side of the blaster. This gauge is activated by pressing a rear-facing trigger at the back of the trigger-grip area. As with the large Water Warriors models, the gauge glows all-green when optimal pressure is achieved. The problem, though, is that this system requires batteries to power the gauge. As well, the positioning of the gauge-trigger is not necessarily the most ergonomical. However, the gauge does work well, though a non-electronic version would have worked just the same. One minor complaint is that the size of the trigger-grip area is shorter, making it a little awkward to hold for those with larger hands. The stream produced by the Firefly is quite good for a soaker of its size. Combined with its respectable reservoir capacity, the output of this blaster may surprise many unfamiliar with this type of soaker. Overall, the Water Warriors Firefly is a decent lower-class water blaster. Great for backup or as a primary blaster in smaller skirmishes, the Firefly can hold its own again other soakers of similar sizes. Just beware of any soaker using constant stream-type technology. Small, easy to pump and use, and has a good sized reservoir. Stream quite good and pressure gauge helps one determine how well the shot will fly. No separate firing chamber. Pressure gauge requires batteries to function. Positioning of the pressure gauge trigger may not be comfortable to some. Trigger-grip region rather short. I just got the Firefly yesterday. The first ever Water Warriors gun I got to get a taste of what they were like before the new ones I want come over to the UK this summer. The electronic pressure gauge is a nice feature and looks cool when you pump it when it is not so light out. It is a PR (Pressure Reservoir) gun though meaning it has no firing chamber. Each time you pump it takes longer but the shot gets better, output is increased, range improves, shot time increases and the beam of water gets more powerful which I think for the size of this gun is very good. When I tried it out I was definately surprised. It is more powerful than you think. Great to use as a backup or main weapon in small fights. It is also built well with a nice guided tracked pump and feels very sturdy. Overall this is a very good weapon for its size and can fool an unsuspecting enemy sometimes with its power and quite good soakage. Very light as well and easy to use in general. The only gripes that I have with it are that it is PR, it may take a bit longer each time to pump it up as the shot gets better and that it gets a bit uncomfortable since the electronic pressure gauge lever is right behind the trigger which can hurt and annoy your hand after a while. Even though the gauge uses batteries it doesn't bother me. A great little weapon to have in your arsenal. I am looking forward to this years line of Water Warriors guns when they come out over here.